We wish you a very Happy New Year! May the joys and celebrations of 2007 remain steadfast memories. May you experience good health, wealth and happiness in 2008! Here's to a New Year! Today marks the 86th year for our dear old dad, 'the King' as my mother referred to him. 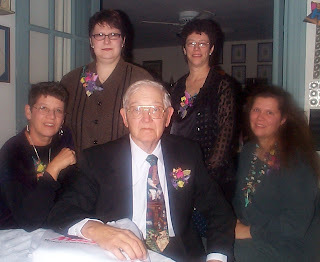 Here, Byron L. Reppert, the patriarch, is surrounded by his four daughters during a surprise birthday celebration for his 80th. Earlier this month he announced, 'don't do anything special for my birthday this year', to which we all agreed; only later to find out the Penn State football game was scheduled for Dec. 29th. A true Penn State fan, we then understood the reason why he didn't want any hoopla for his birthday as he would be firmly planted in front of his TV that evening. Penn State won the game, the Alamo Bowl, 24 - 17, against Texas A & M - a perfect birthday gift for someone who has everything he needs. We wish you Peace, Joy, and Happiness! May the Blessings of the Season be with you throughout the year. The Reppert and Brill families of The Rosemary House and Sweet Remembrances. The advent wreaths we made as a class earlier in December are holding up very well. This is one has been used as a table centerpiece all season and it is still as perky and fresh looking as the day it was made. The last herbs to discuss in our advent series are the Gift of the Kings, Frankincense and Myrrh. Frankincense (Boswellia carterli) is an exudate from the wounded bark of a tree. The milky secretion forms tear drops that are used world wide as an incense. 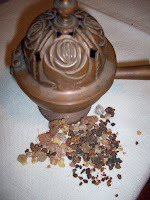 According to the ancient law of Moses, it should be burned in a proportion of six parts to one part of myrrh, and its pleasant fragrance compliments the musky odor of myrrh. Its presentation to the Child signified recognition of His divinity. Myrrh (Conniphera myrrha) is a dark resin that exudes from the bark of a small tree of East Africa and Asia. This forms"tears" which are used in perfumes, as incense, and as a healing agent for embalming purposes. In ancient times it was valued more than gold. As a gift to the Christ Child, it signified his mortality. Looking for something easy and delicious for a holiday party? These chocolate truffles made using three ingredients fit the bill! These candies take less than an hour to pull together, and another hour in the fridge to chill and you're good to go. They don't last long in our house! Using a food processor, crush 6 of the Oreo cookies until fine crumbs are formed. Set crumbs aside in a bowl. Crush an additional 36 Oreo cookies (until they change the number of cookies in a package, that leaves 3 cookies to eat while preparing this recipe, because you know you will) to fine crumbs in the food processor. Cube the cream cheese and add it to the cookie crumbs. Process until fully blended. Roll this mixture into 1" balls. The mixture is easy to roll and does not need to be chilled before rolling into balls, or before dipping. Melt the semi sweet chocolate. It will melt easily in the microwave in one minute intervals. Stirring after each minute, it should be melted after two minutes. Dip the candy into the chocolate and sprinkle with reserved cookie crumbs before the chocolate firms. Place on wax paper covered baking sheet. Chill for approx. an hour. Store the truffles in the refrigerator. To serve, place in colorful candy cups and enjoy! This year we made charming Dip Tree package tie-on's and gifts. Supplies needed include clear cone shaped cake decorating bags, herbs and seasonings, a cinnamon stick for the tree trunk, some thin gold glitzy ribbon and of course star anise for the top of the tree. First you fill your bag with the herbs. We used 1 teaspoon of celery seed in the tip of the bag, 1 teaspoon each of garlic powder and onion powder for the middle layer with a little bit of dried red tomato for color and one teaspoon each of Basil, Thyme and Parsley leaf for the largest bottom layer of the tree. Next we poked the cinnamon stick tree trunk into the bottom layer of herbs, and secured it tightly with ribbon. Depending upon the size cake decorating bags you are working with you might need to cut it shorter. Finally, we hot-glued the Star anise to the top of the ornament. If you are using these as ornaments, loop a thin piece of glitzy gold ribbon and attach it underneath the star anise with glue. Tie a perky bow at the base along with a label listing ingredients and the instructions to prepare the dip. The attached instruction card read: Add the contents of the dip tree to 1 C Mayonnaise and 1 C Sour cream. Stir and chill overnight, serve with veggies or chips. These were easy to make, festive and fun to eat too! This is the other tabletop tree that graces the tea room during the holiday season. The decorations for this tree change each year, but what is special about this tree is the stand that holds it. It is a family heirloom, originally belonging to my grandmother. It is a revolving music box tree stand from Germany. The cast iron tree holder is designed to resemble a pine cone. The ornate base is nickel with a wooden floor plate. The large key is what you use to wind-up the stand. There are two switches on the base, one will simply make the tree rotate, the other will turn on the music as the tree revolves. According to my mother, it originally played two songs, but as long as I can remember, it only plays one. It is a beautiful music box, and such fun to show the guests that are here for tea. While growing up, we would use this to hold a live tree which we would decorate for the second floor of our home. Those days are now beautiful memories, but it is always such fun to bring this special heirloom out of the attic for the holiday season. Another festive weekend has passed with our traditional Take Tea! Take Joy! holiday tea. These photos show the sandwiches that we served at the tea. We had a Christmas tree cucumber sandwich, pumpkin cream rosette with parsley garnish on brown bread, a cinnamon, raisin, walnut finger sandwich on raisin bread, a toasted Parmesan cheese wreath, and a cranberry chicken salad on white bread. Although the weather didn't want to cooperate this weekend, we did have some intrepid tea enthusiasts that came regardless of the weather. It was a joyful time. I salute you! There is nothing I can give you which you have not; but there is much, that while I cannot give, you can take. No heaven can come to us unless our hearts find rest in it today. Take Heaven. No peace lies in the future which is not hidden in this present instant. Take Peace. The gloom of the world is but a shadow, behind it, yet, within our reach, is joy. Take Joy. And so, at this Christmas time, I greet you, with the prayer that for you, now and forever, the day breaks and the shadows flee away. Thyme - is allegedly one of the herbs of the manger along with pennyroyal and bedstraw. All three of these herbs are both soft to lay a baby on and also flea repelling herbs. Sage - The beautiful silvery foliage of sage is delicious in poultry stuffing but also Moses was directed to make the gold menorah based on the growth habit of Salvia. Bay Laurel - Native to the Holy Land, it spreads into thickets, used throughout the Greek and Roman period as a sign of nobility and honor. King David says in Psalms "I have seen the wicked in great power and spreading himself like a green bay tree." While there are many other herbs and plants of the Bible, these are a few that are available in our garden now and that are relevant specifically to the advent season. This jolly old fellow, a surprise Christmas gift from a far away friend, arrived in the mail yesterday. He's the perfect addition to my collection of culinary Santas. Isn't he just ideal for a tea room!? There he is, happily pouring a cup of perfectly brewed tea. He has been nestled among the others Santas, smiling as if he has always been a part of the collection. Thank you dear friend, for thinking of me this holiday season. What a surprise it was to receive this gift. You are so thoughtful. I treasure our friendship, and will always think of you when I glance at this jolly old elf! Another Wednesday has come and gone, and an Afternoon Tea seating has taken place at Sweet Remembrances. Every Wednesday we serve a special Afternoon Tea, by advance reservation please. This week we started with some homemade organic butternut squash and apple soup, lightly dusted with freshly grated nutmeg. While the guests were enjoying their soup, the scones were baking in the oven, and the tea trays were quickly being prepared. Our three tiered tea tray consisted of sandwiches on the bottom tier - sliced chicken with basil pesto mayonnaise, ham salad in phyllo cups, asparagus and blue cheese rollups toasted in the oven, and tiny cucumber sandwiches garnished with fresh parsley and pepper. The scones included the Traditional English Cream Scone and an Orange Pecan Buttermilk scone accompanied with mock clotted cream, jelly, and lemon curd. For desserts, we served pumpkin nut roll, mint frosted brownies that were decorated with icing holly leaves and red berries, and holly leaf shortbread cookies sprinkled with red and green sugars. It was a very festive holiday treat. Of course, all of this was accompanied with a bottomless pot of tea kept warm with thick holiday tea cozies. With seasonal music playing in the background, friends meeting friends for tea, it was a perfect way to forget the hustle and bustle of the holiday season. This stairwell, which greets you in a festive fashion, is just inside the entrance to the tea room. For the holiday season, I love to decorate it with a draping swag that goes all the way to the second floor. Covered with twinkling lights and colorful red and gold bows (a useful skill my mother taught me as I was growing up), there are pieces of holly, glittery gold leaves and red poinsettias and ornaments tucked in the swag. The steps are oak, refinished many years ago by my father, and the newel post is a birds eye maple. Here are also a few more of the tea themed ornaments on my tabletop tree. "Fa la la la la, la la la la! 'Tis the season to be jolly!" A tabletop tree is the perfect decoration for a tea room - perfect size, eye level for viewing, and festive for the season. A tabletop tree decorated with tea themed ornaments seems the perfect solution for a tea room tree. This little tree is my favorite holiday decoration - one of the first to go up during the decorating session, it brings smiles to my face as I see the little ornaments again after a year. All tea related in many ways, most were gifts from family, some are even jewelry pieces, others are tea strainers that aren't really practical to use but perfect for a tree, and several bring memories of vacations past where I found a sweet remembrance that would be perfect for the tree. Alas, I can't show each and every ornament, you need to visit the tea room to see them all, but here are a few that grace this very special tea tree. Plants in our Advent Wreath. Wet, wet, wet on this second Sunday of Advent. 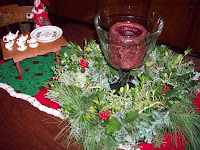 The Advent wreath is a circle to remind us of God's love which never ends. Evergreen branches in the wreath and Christmas trees are symbols of everlasting life. The advent wreath we began last Sunday had a nice base of evergreens. To that we added a bundle of mature ivy (Hedera helix) with berries and also some berried Holly (Ilex aquifolium). The ancients believed evergreens to be symbols of the continuity of life through the dark days of winter. The plants verdant foliage has decorated homes at midwinter solstice since pre-Christian times. Early Christians saw in the spiny leaves of the holly the crown of thorns, the red berries symbolized for them the blood of Christ. Ivy was believed to lessen the influence of wine, as well as assisting in predicting the future. In folklore, both plants are powerful protectors against evil. What fun we had this past Saturday....a tea room full of moms and daughters each working together as a team to decorate a Gingerbread House. It was a delight to see the many creative ideas that were swirling around the room. These photos show a sampling of the houses that were crafted that day. Mini pretzels were used as a fence around the house. And tree-shaped pretzels adorn the yard of one of the other houses. Wheat Thins became shingles and M & M's evolved into a path to the door, a mini candy bar. Why, even Santa is atop one of the houses, with a candy bar sleigh and candy cane runners. How clever - no two houses alike! After the decorating project, we had a very simple tea party with hot chocolate and gingerbread. .......Santa Claus is coming to town... and here's a peek at a few of the Santa decorations that adorn the tea room this holiday season. The culinary Santa collection is just inside the main doorway, greeting you upon arrival. And on occasion, there are even delicious fragrances wafting from the kitchen that you might just believe Santa was quite busy himself, baking a batch of those gingerbread boys and girls or perhaps a spiced plum pudding. The other grouping of Santas is perched high on a shelf in the main room. When we were getting the tea room ready to open, my father made several narrow shelves that sit above the doorways and are perfect for displaying special collections. This particular shelf changes with the holidays, or it can also be found filled with a collection of ornamental teapots. The perky stuffed Santa with the fuzzy beard and dressed in a red flannel outfit is one that I stitched in my teenage years! He has seen many a holiday, and I chuckle when I see him, as he magically transports me to my youth. Even though his beard is thinning and his buttons are popping off, he stirs memories that are quite special. He sees you when you're sleeping, he knows when you're awake, he knows if you've been bad or good, so be good for goodness sake. We are busy decorating for the holidays and also holding a variety of classes to help others prepare for the holidays both inside and out. One of our classes this week was as my kids would say "easy peasy". This roping class was made with a combination of faux and fresh greens. The trick is to have a piece of faux roping, we used 9 foot lengths. The secret is it must be roping that is wired and bendable. Then you simply add a variety of fresh cut greens. If you are going to use it indoors the greens must be well conditioned. To condition greens we cut them and put them in room temperature water for 2 or 3 days. If possible it is best to submerge them. If you are using the roping out doors the conditioning process is not as critical as it is if you plan to use greens inside our dry homes. So to make your own roping, cut your conditioned greens into 6-8 inch pieces and wire them into the faux roping using the bendable wired roping as your mechanic. The class went very quickly with most everyone finishing their project in about an hour. We had a large variety of greens: white pine, scotch pine, boxwood, chamaecyparis, red berried holly (for outdoor use), variegated arborvitae, concolor fir, and then some of the ladies added in pinecones and ribbon also. Brrrr, it is a damp and chilly first day of the Advent season! Another of our Christmas workshops was to create these beautiful advent wreaths. We used a block of floral oasis, which we quartered lengthwise to fit around a 10 inch box wire wreath form. Everyone worked on a black catering tray to keep the moisture off the table and to make it easy to carry the wreath home. We added a large variety of fresh cut greens and herbs to the oasis. Since these greens and herbs are in oasis that you can continue to add water to, they will stay green and fresh throughout the whole season of advent. To make our wreaths even more special we used a number of herbs and greens that are found in the Bible. A few of the greens of the Bible used in this wreath are mentioned in Isaiah 60:13 'The Glory of Lebanon shall come to thee, the fir tree, the pine tree and the box together'. Those three greens and the majestic Cedar of Lebanon formed the base of our advent wreath. Cedar was for centuries a rich source of timber for countries around it. Solomon built his great temple which endured for 300 years. Not only is it a strong tree but a beautiful one as well. Cedrus means "strong and firmly rooted". We also added other herbs of the Bible or plants that have an association with the advent season. We will blog on those on the other advent Sundays. Angels, Angels and more Angels were featured at historic Union Church in our charming little town of Mechanicsburg, PA. A small but hard working committee organized this display of all types of angels from the "mop head" angel on the chair to the golden home made paper mache angel, which has become a family heirloom. It was a cold and chilly night, when our family walked down to our town's tree lighting ceremony and then to Union Church to see the angels. The young and young at heart received a halo and were read a children's story about angels. We finished our evening with a carriage ride around town.